Download iPTool for resetting printer canon iP1600, iP1700, & iP1800 blinking. iPTool is general resetter for canon iP series. The tool also support iP1200, iP1300, iP2200 and iP2500. There is many useful tools for printer on the iPTool. The application can be used to reset, maintenance, view status, and more. iPTool is portable application like MPTool software. So, you can run the resetter from removable drive. I’ve tested the software on Canon Pixma iP1300, 1P1700, iP1880 and 100% work. 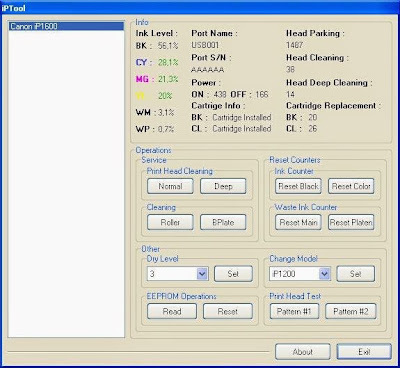 iPTool Canon Resetter having many useful features such as print head cleaning, test nozzle, reset printer functions, rollers printer cleaner, read & reset printer EEPROM, and more. There is two main features for this Canon software resetter; info section and operation section. On info sections, you can view the printer status such as ink level, port name, and serial. Also offer info how many time the printer ON or OFF. Or you can view how many times you’ve clean the printer head, replace the cartridge, and more. On the operations sections is contains important tools to reset the printer. Ink level & counter resetter is important tool. Other tool is cartridges head cleaning & test. All features on operations sections can be used just in one click. Before using iPTool, you must reset the printer manually. Search on google for manual reset. I’ve download & test iPTool to reset Canon iP 1300, iP 1700 and Canon iP 1800 series and the canon printer detected successfully.